A rotating machine has two parts stator and rotor. Stator does not move, and it is the outer frame of the machine while the rotor is movable and inner part of the machine. These are made up of ferromagnetic material. The slots are cut on the inner edge of the stator and outer periphery of the rotor. Conductors are placed on these slots. These conductors are connected to form winding and voltage is induced in these windings these are called armature winding. The winding which produces the main flux is called field winding. The permanent magnet may also be used to produce the main flux in some machine. D.C machines are of mainly two types, the D.C generator, and the D.C motor. The device that converts mechanical energy into electrical energy is called D.C. generator, and the device that converts the electrical energy into mechanical energy is called the D.C. motor. It acts as a supporter and protector for the pole cores. It is used to form the part of a magnetic circuit. It supports the field coils. It increases the cross-sectional area of the magnetic circuit and reduces its reluctance. The poles are laminated to reduce the eddy current losses. The armature is the rotating part of the D.C machine. It consists of the shaft upon which a laminated cylinder (armature core) is mounted. The purpose of lamination is to reduce eddy current losses, and the insulated conductor is put in the slot of the armature core, it is called armature winding. The two types of winding used in armature are - wave and lap. The Commutator is made up of a large number of wedge shape segment made up of hard drawn copper. These segments are insulated with respect to each other with the help of their sheet mica. It is in the shape of the smooth cylinder over which carbon brushes are provided which are in just touching position of the round surface of the cylinder. 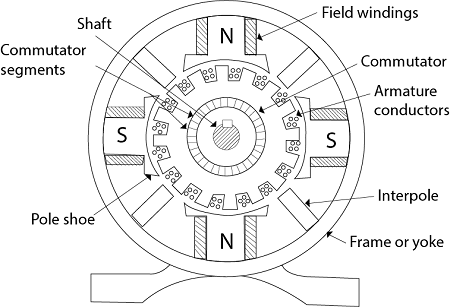 The Commutator and armature are provided on the same shaft. If mechanical power is fed to the machine in the presence of a magnetic field, an a.c e.m.f is generated in armature conductor which is then collected through carbon brushes and the machine is said to be operating in generating mode. It is the function of Commutator to convert all the negative half cycle into the positive cycle and smooth out the ripples into an output voltage. On the other hand, when the armature is connected to a d.c source through carbon brushes in Commutator, a torque is developed and acts on each conductor of the armature, and the machine starts working as a motor. Therefore we can say that carbon brush along with Commutator behaves as mechanical rectifier or inverter. The equivalent electric circuit is used to represent the armature of a d.c generator. It can be represented by three series-connected elements E, Ra, and Vb. The element E is the generated voltage, Ra is the armature resistance, and Vb is the brush contact voltage drop. The equivalent circuit of the armature of a d.c generator, d.c motor is shown below. In case of a D.C. motor, E is the back e.m.f.